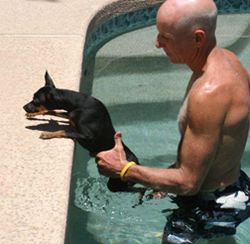 There are a number of people across the country who espouse to offer physical therapy or swim therapy for dogs. Many have very little training or no experience. Make sure before you allow your dog to be treated by someone that they have the appropriate education to do so. After all, the last thing you want is to injure your pet, especially if they just had surgery or a spinal injury. Ensure that the person offering the canine services of rehabilitation or therapy has completed the University of Tennessee’s or the Canine Rehabilitation Institute’s certificate programs. Veterinarians and Physical Therapists both go through these programs.